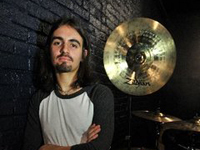 Jay Weinberg was born September 8, 1990 and is an American drummer. He plays with the punk band The Reveling and is currently touring as a substitute with Bruce Springsteen‘s E Street Band. Weinberg is the son of drummer Max Weinberg, who joined the E Street Band in 1974; his mother Becky is a former teacher. He grew up in Middletown Township, New Jersey. As a child, he played travel team ice hockey as a goaltender. At age 9 he first saw the E Street Band on their 1999–2000 Reunion Tour, and saw shows on this and subsequent tours, especially in Europe. Around the same time his father took him to Ozzfest to see Slipknot, which gave him a strong affinity for heavy metal and other intense music genres; his father also exposed him to a wide variety of other music. He began playing guitar at age 9, bass at age 12 or 13. He then started playing drums at age 14, mostly self-taught and without instruction from his father but using his father’s old gear. By the next year he had performed a guest appearance on stage with screamo band The Used and subsequently with punk rockers The Bouncing Souls. He played in the New Jersey metal band Chaosis. He attended Rumson-Fair Haven Regional High School where he played on the hockey team for a time and graduated in 2008. He attends Stevens Institute of Technology in New Jersey as a student in the Wesley J. Howe School of Technology Management. He aspires to marry a music career with a solid business knowledge. He joined the New York punk band The Reveling in August 2008, which plays before small audiences in venues such as the Ace of Clubs nightspot in Manhattan and various spots in Brooklyn. With them he does some of the band’s songwriting and arranging. Jay Weinberg’s first appearance with Springsteen was in the summer of 2008, filling in for his father on “Born to Run” at Giants Stadium after having watched many other performances during the Magic Tour. Springsteen’s 2009 Working on a Dream Tour posed a problem for Max Weinberg, as The Tonight Show with Conan O’Brien in Los Angeles – for which he was The Max Weinberg 7 bandleader – was starting at the same time that the tour would be in progress. Springsteen’s manager Jon Landau viewed Weinberg was the “secret weapon” to substitute for his father without losing fan satisfaction. Both Landau and E Street guitarist Steve Van Zandt attributed Jay Weinberg’s skills to a genetic gift. Once the tour began in early April 2009, Weinberg played from several songs to half the show on most of the dates. His playing with Springsteen integrated a polyrhythmic approach influenced by nu metal bands such as Lamb of God, Mastodon, and Slipknot with the E Street drumming style derived from big bands and early rock and roll. He received a very positive reaction from both audiences and reviewers as a re-energizing “spark plug” for the much-older band, with his vigorous, long-hair-flying style inviting comparisons to Dave Grohl and his potential for replacing his father drawing allusions to Wally Pipp. He began playing complete shows in mid-May 2009 during the tour’s American first leg, as his father went to California to prepare test runs for the The Tonight Show start. Modern Drummer magazine’s editor said that a college freshman playing on one of the year’s biggest rock tours is “certainly a unique story”. He played at the Dutch Pinkpop festival in Landgraaf, the Netherlands.